Two weeks ago I introduced our new decorative glazed ceramic tiles. In that post, Geometrical Ceramic Tiles Ring in the New Year, I explained how two popular cement tile patterns, our Geo 10 and Traditional Anillos, are now available in a glazed ceramic tile format. I also promised to to share some additional forthcoming patterns and I'm excited to unveil them now. Ellipse is one of my favorite new motifs that works great as single or double row accent strip for a kitchen backsplash or bathroom wainscot. The simple, soothing inter-connected ellipse pattern is slightly contemporary but takes its design cue from Art Deco styles. Further, the hand-painted glazes provide traditional artisan craftsmanship and variation. The patterns are all more contemporary than our traditional Spanish and Malibu lines. Geometrical tile pattern glazes are from the Malibu Field Tile palette and make designing easy and fun. In fact, the flexibility in the Geometrical deco line lies in the ability to pair and complement the patterns with colors from the 50+ available glazes from our Malibu Field Tile collection. To make it easy, all the colors used in the pattern are identified on the site. Malibu Field Tile are available in 3"x3", 6"x6", 4"x4", 4"x5", 6"x6" and 4" Hexagon. You'll also find a full line of trim and molding. Aragon is another new pattern using a classic cross and quatrefoil motif. It's available in four standard colorways. I love the simplicity in this classic black and gray colorway. The colors and pattern motif can really change the mood. Look what happens when the same pattern has soothing earth tones juxtaposed to charcoal to create a checkerboard. The cherry red glaze outlines each cross and makes it really pop. Geometrical Aragon is new pattern. Colorway 2CD is shown here. Malibu Cherry Red is a stunning glaze with lots of natural variation. I can't wait to see a fireplace or pool sideboard adorned in the color. I'll let the color segue into another new pattern, Weave. Here, the Geometrical Weave pattern uses that bright red and white to really add a pop of color and bold design. Weave is pattern in the new Geometrical line. Shown here in Cherry Red and White. Red not your color? Want to mix up the pattern? Look at how playful and sophisticated, this pattern can be when a mix of colors is used. Remember, the Geometric glazed ceramic tile patterns are available in 6-, 5-, 4-, and 3-inch square formats. Each pattern is offered in at least four colorways. These high-fired, quality tiles are suitable for indoor or outdoor use. The tiles are hand-painted in the USA using the traditional "Cuerda Seca" (dry cord) technique. Expect variation in the glaze colors, as well as a slight relief from pooled glazes. These tiles can also be made for submerged wet applications, such as pools, by applying a clear overglaze. For floor applications, grit can be added to the glaze to reduce slippage. Tiles are made-to-order so please allow about four weeks, including transit times, for delivery. Want to see more? Take a look at all of our glazed decorative Geometrical tiles. These tiles offer the prefect decorative solution. For January, I continue to welcome 2015 with our newest tiles. Today I showcase three new patterns in our ever-popular Arabesque cement tile line which is part of our curated Spanish tiles honoring traditional tile-making techniques, patterns, and colors. What I like about the first two lines is you'll find both a large format appropriate for floors or large walls, as well as a smaller, mini-format that scales down well for a backsplash, small entry or hearth. These two new patterns are called Varona and Villatoro. Their names pay homage to Medieval Spanish castles. Can't you just imagine kneeling down in front of Queen Isabella on one of these patterns? Varona is a new Arabesque pattern. Shown here in Normandy Cream. Villatoro in Tuscan Mustard with a textured, limestone finish. These scaled line drawings show the full-size Villatoro compared to the mini. Finally, the last new Arabesque pattern is Zafra. This large format measures nominally 8"x10" and is ideal for adding pattern to a master bath, larger powder room or living room floor. The Arabesque collection pays homage to a deeply rooted and rich heritage of traditional Moorish and Spanish tiles that feature interlaced geometric patterns. With their nuanced curves and unusual geometric shapes, these Spanish tiles are sophisticated and charming. Choose from traditional bisque colors to create Old World charm, or use a contemporary shade such as off-white and grey. Spanish Arabesque Pavers are made to order and hand-crafted from cement in the USA. To start, select a shape, then choose a color from the Paver Color Palette. Blends and textures are also available. Our Rustic Pavers are a unique line of Spanish floor tiles that can also be used on the wall. Look to our Rustic Paver collection if you desire square and rectangular formats (from 2"x2" to 16"x16") with a rustic feel. Not all tiles will be the exact same shape, as color variation is part of this collection's allure. Exquisitely designed and manufactured in the USA, Avente's made-to-order Spanish Pavers are hand-crafted using cement. These Spanish Floor Tiles in classic shapes create a rustic look similar to what you'd find in traditional clay bisque tiles and pavers from Spain and Mexico. Once you've selected the size, then choose a color from the Paver Color Palette that offers classic clay bisque colors, as well as softer, contemporary shades. Blends and textures are also available. As the new year starts with full force, I think it only fitting to share some of our new tile patterns and lines. This week, I share our new glazed ceramic line. It's a small line that carriers a large, and very popular, design punch. Our Geometric Geo 10 and Traditional Anillos, or Ring pattern, has been very popular in cement, so it's with great pleasure that we are now offering both patterns in a glazed ceramic tile format. The new line, Geometrical Ceramic Tile, melds classic, hand-painted glaze techniques with modern, geometric patterns to achieve an absolutely stunning look. Ideal for kitchen backsplashes, accent strips or anywhere a splash of color, pattern and more modern design is wanted. 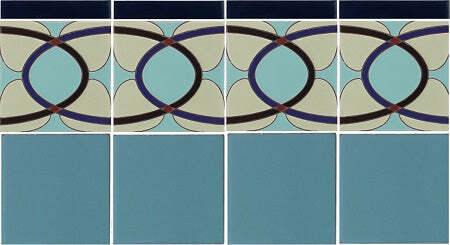 The glazed ceramic tile patterns are available in 6-, 5-, 4-, and 3-inch square formats. Each pattern will be offered in four colorways, and several new patterns will be released by the end of the month. You can complement these decorative tiles with field tile and trim from from our Malibu Field Tile. If you have a small backsplash area where a large pattern or cement tile in an 8"x8" format is hard to fit, we recommend using our Geometrical Ceramic Tile line. Or, if you want to carry the same geometric motif with a different look, these tiles offer the prefect decorative solution! Cement tile is paired with locally sourced coral stone to create this stunning wainscoting for a bathroom. If you've ever seen a decorative treatment on the lower half of a wall, then you've seen wainscoting. Traditionally, wainscoting is used to protect walls from becoming damaged when chairs or other furniture is moved around, such as in a dining room or eat-in kitchen area. To get a better understanding, let's look at how wainscoting evolved. Pattern and color continuity flow through this Dominican Republic home with the use of a cement tile and coral stone wainscoting. Interestingly, according to the Online Etymology Dictionary, the word wainscot, rooted in the mid-14th century, means "imported oak of superior quality (well-grained and without knots), probably from Middle Dutch or Middle Flemish waghenscote; related to Middle Low German wagenschot (late 14c. ), from waghen (wagon) + scote (partition, crossbar) and perhaps because the wood originally was used for wagon building and coachwork." Fast-forward now to Elizabethan times where wainscoting grew in popularity as a decorative and protective wall covering. It is still commonly used in Colonial American and English homes. 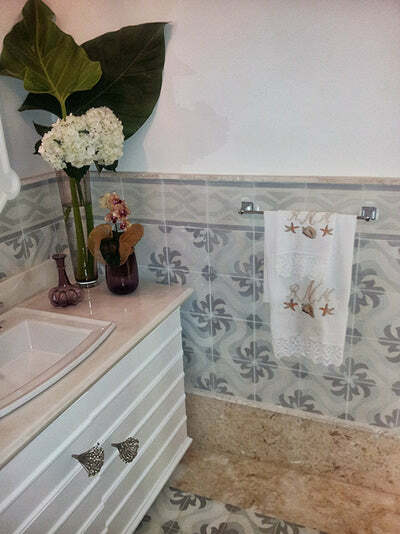 Manzanillo Cement Tile adds finesse to any wall or wainscoting application. La Rochelle Cement Tile creates a harmonious outdoor wainscoting. 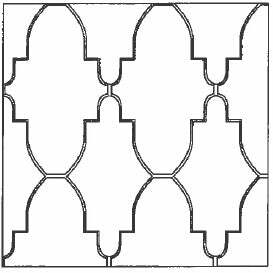 Currently, you can integrate wainscoting into your home with the versatility that only handmade cement tile offers. For a modern, contemporary or vintage look in a bathroom, hallway, or any living area, cement tile provides an ornamental and functional wall treatment that limited only by your imagination. Vibrant Traditional Bayahibe Cement Tile as wainscoting. 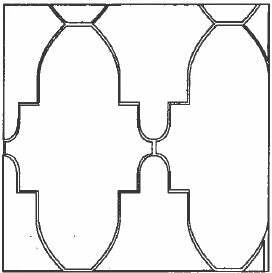 Whether you use cement tile wainscoting for an indoor or outdoor application, keep in mind that each cement tile is individually handmade. Slight variations, such as thickness, shade, imperfections, and irregular edges are inherent to this type of product. These characteristics add to the product's natural appeal and do not compromise the performance of the tile. Lastly, for more information about cement tile selection, installation tips, customization services, or available sizes, shapes and more, please see our Guide to Buying Handmade Cement Tile.